East and West, Tradition and Modernity, Discipline and Freedom: The Chinese artist Zhuang Hong Yi (* 1962 Sichuan / China I lives in Rotterdam and Beijing) combines these apparent contrasts almost effortlessly and condenses them in works that are highly haptic, three-dimensional and their changing color gradients act as images rather than wall installations. His flowerbeds, flower heads sprouting from the screen, the Chinese arts and crafts in their material language of rice paper, ink and lacquer, but stylistically oscillate between European Neo-Impressionism and Western abstraction. Essential for Zhuang Hong Yi's works are the virtuously incorporated color shades that immediately evoke new effects and perceptions at the slightest change of position of the observer. 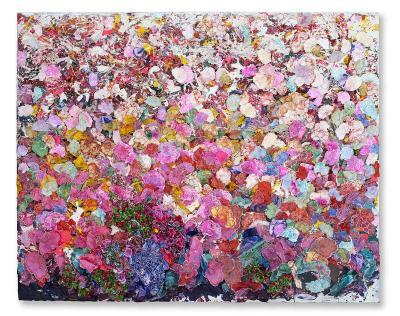 Thus, Zhuang Hong Yi takes up the basic idea of ​​kinetic art; The movement here does not proceed from the object itself, but arises only through the action of the recipient.